The innovative reusable "KeepCup" vessel, designed and made in Australia, earned the trust of environmentally conscious, coffee lovers and not only, in 65 countries worldwide! KeepCup consists out of four parts: the cup itself, a removable lid with an also removable plug on it and a silicone band surrounding the cup, combining both usability and a unique style. Made of polypropylene #5, a thermoplastic polymer with a high melting point (160° C), resistant to hot liquids, without splitting and releasing toxic substances in the liquid content. Choose among a wide variety of colors, with the option to personalize different parts of the vessel each time (cup, lid and its plug, silicon band). Microwave (lidless) & dishwasher safe (upper shelf). 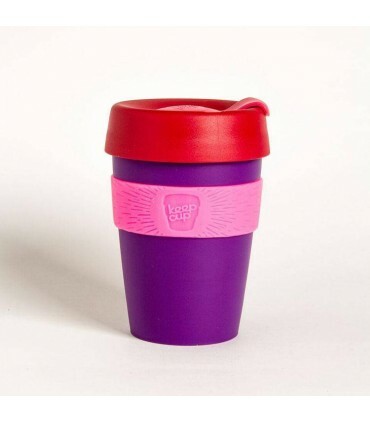 Keep in mind that 20 disposable cups contain the same amount of plastic with a small KeepCup. Most "paper" disposable cups contain polyethylene (one of the most commonly used plastics). Think "Green" - Think "KeepCup"! Help us reduce the greenhouse effect by using a KeepCup! The use of a reusable KeepCup during a year, instead of conventional cups, helps to reduce the emissions of gases, that cause the greenhouse effect, up to 92%.